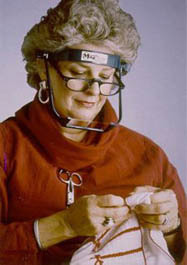 This hands-free, head-mounted magnifier is perfect for needlework! Optical quality acrylic lenses reduce eye strain. Slip-on cushioned headband fits all and works with or without prescription glasses. (You can leave your glasses on) Visor swings out of the way when not in use. Lightweight and easy for travel. 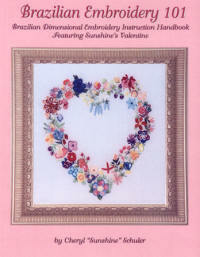 Quilting, embroidery, hand beading, manicures/pedicures, woodcarving, lace making, painting, knitting...for any close work. Jewelry makers and miniature train hobbyist love these magnifiers! 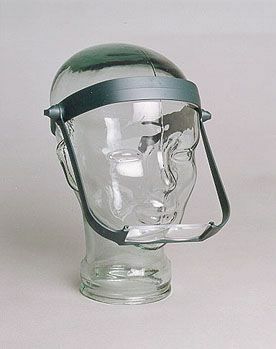 Visor swings out of way when not height="1" width="1"
Lens #5 = 2.25x working distance approximately 7"-10"
Lens #7 = 2.75x working distance approximately 4"-7"